Quality engineered to your specific height requirements. Designed for safety and convenience. wont sag or dish (supplied as standard). 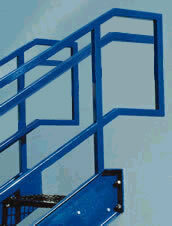 Factory welded handrails of 1 1/2" x 11 Ga. square tubing. 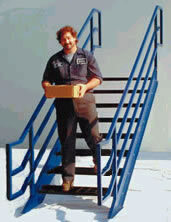 galvanized (Chart II), or or galvanized and powder coated. widths. Other widths available upon request. treads. 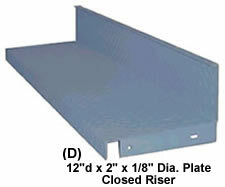 12" deep closed riser diamond plate. 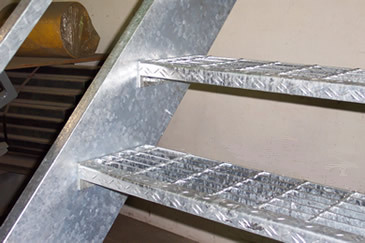 of its more gradual rate of rise, the BOCA stair does require more horizontal floor space. Our standard finish is a quick dry polyester powder coat Gray (RAL 7005). Also available in Black (RAL 9005), Blue (RAL 5015), White (RAL 9016) and Safety Yellow. 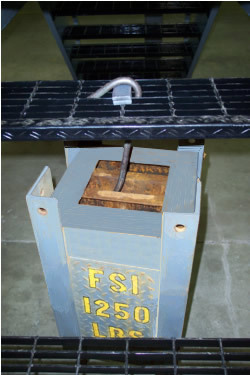 Two Part System which is our powder coat over a hot-dipped galvanized undercoat. to view this web page. 3" long x 1 1/2" flat bar bearing surface. Underside view of 1250 lbs. from center of stair tread. 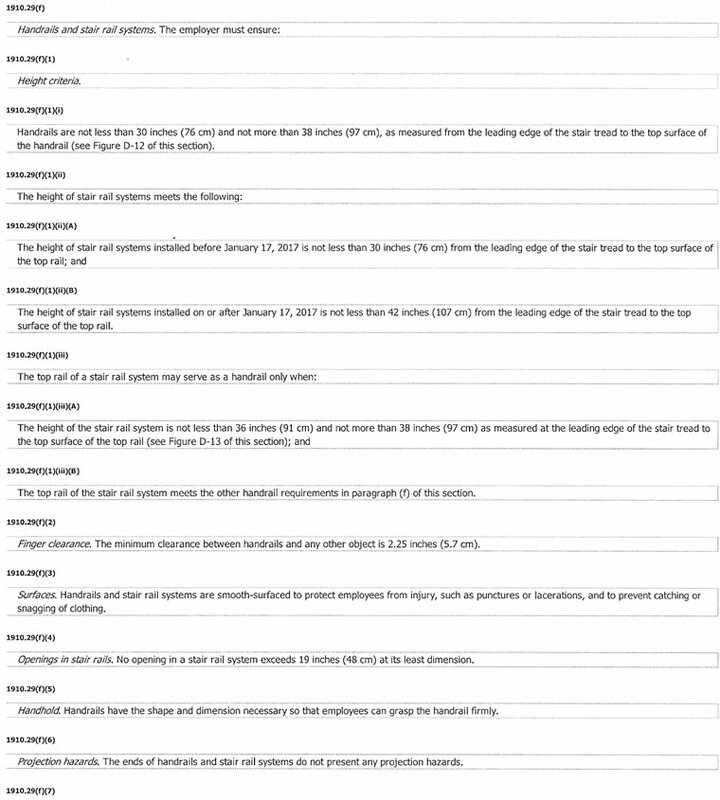 Equipment; Final Rule, November 18, 2016.
you can consult OSHAs website at http://www.osha.gov. questions, residential roof questions, and agricultural operation questions. 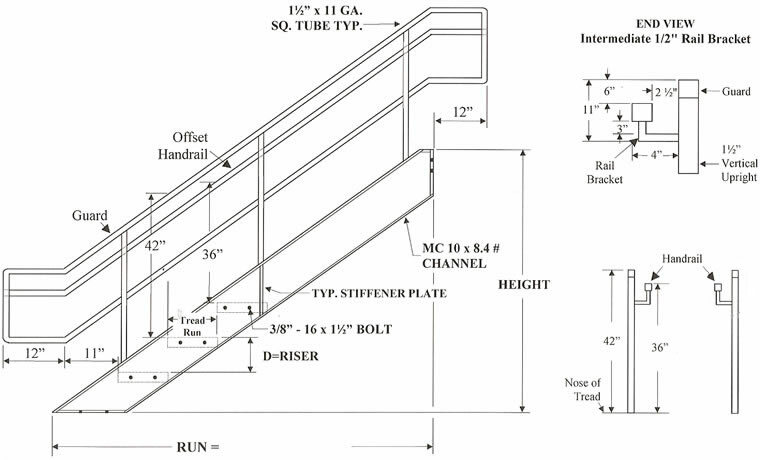 January 17, 2017 (§19210.25(c)(5)), also apply to stairs designed and fabricated, but not yet installed, by that date? 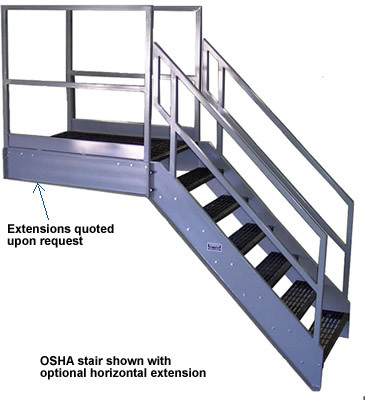 installed, will be in compliance if they met the previous requirements for standard stairs. 36 inches if the stair rail doubles as a handrail? pliance with the requirements in the old standard. 7, 2017. Therefore, the maximum angle for standard stairs is 45 degrees. after January 17, 2017. Therefore, the maximum angle for standard stairs is 45 degrees. 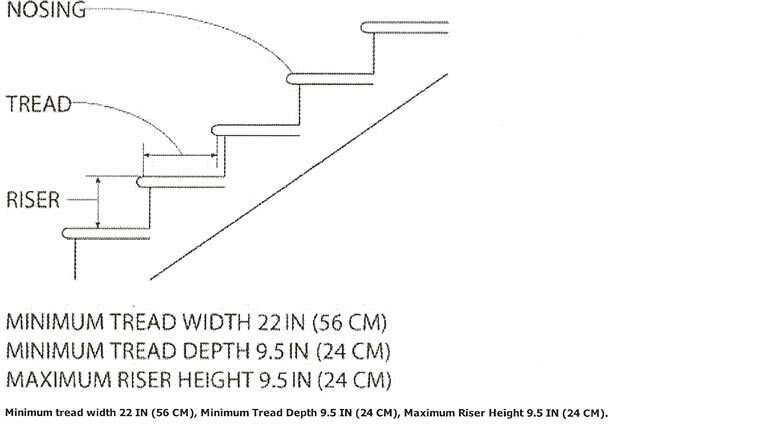 Are stairs installed after January 17, 2017, that have an angle of 50 degrees considered to be ships stairs? obstruction of at least 6 feet 8 inches. travel and opens onto the landing? Does the same dimension apply to this condition? equally to stairway doors that are perpendicular to the direction of travel. 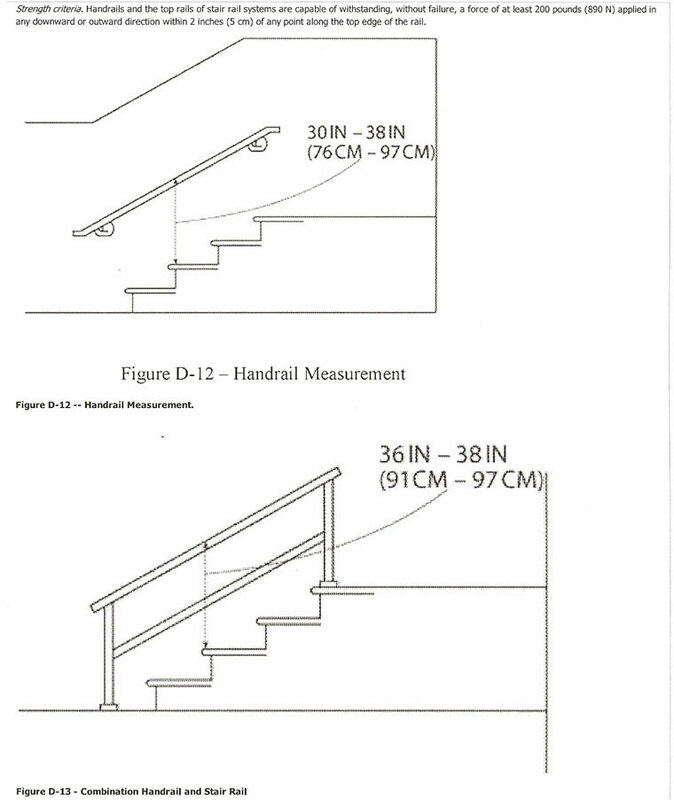 those stairs fall under the exemptions in §1910.25(a)? the exterior of other tanks, employers would have to ensure they comply with the requirements in §1910.25(b) and (c). 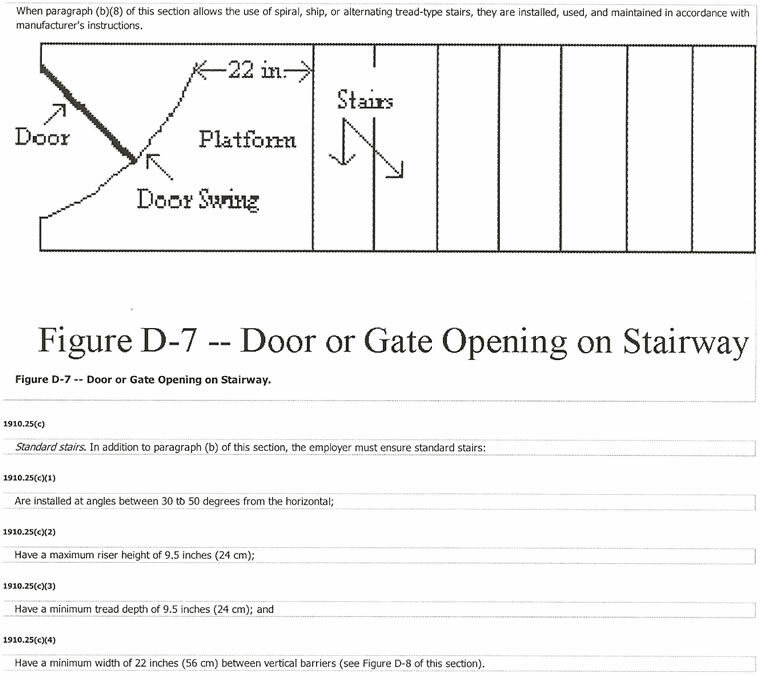 Would winding stairs attached to tanks be required to meet the requirements in §1910.25(d) for spiral stairs? therefore, they are not spiral stairs and must meet the requirements of §1910.25(b) and (c). and handrails required on stairs that have two open sides and are less than 44-in. wide? Yes. 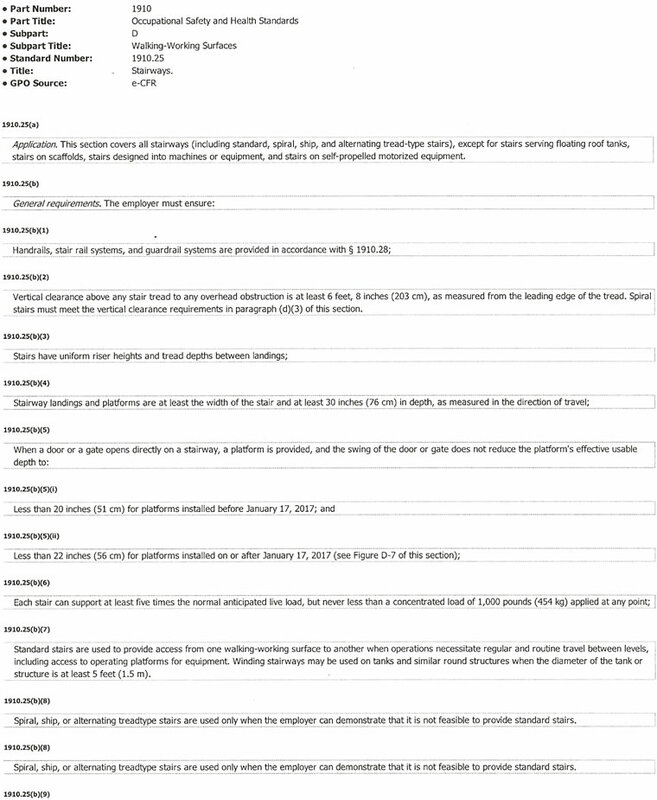 Section 1910.28(b)(11)(ii) Table D-2 contains a printing error, which OSHA will correct in a published notice. 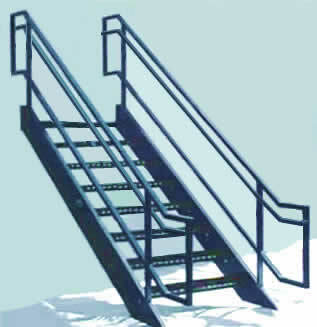 "One stair rail system with hand rail on each open side" is required. (See 81 FR 82611-12). 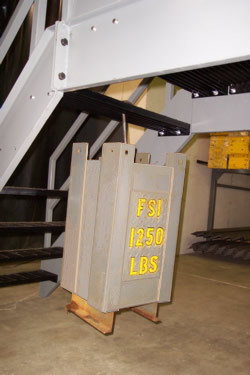 your complete source for material handling equipment.